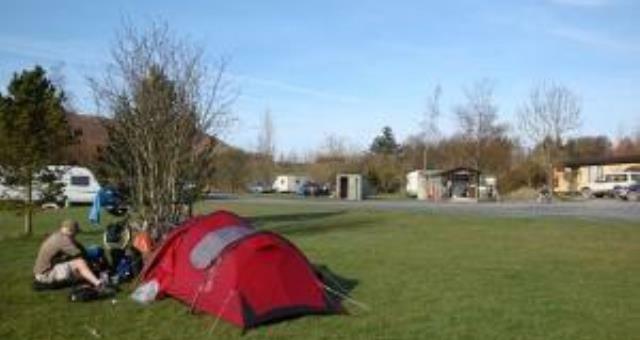 Fforest Fields Caravan & Camping Park01982 570 406work Touring & Camping ParkFforest Fields is a 4 star caravan and camping site set on our family farm in the middle of an area of outstanding beauty in the Welsh countryside. We are honoured that you choose to spend your precious holiday time with us and we work hard to ensure that your stay here is as special as it can be. Most of the time that simply means a patch of grass, family, friends, views, hot showers and space to breathe. Whether you come with a caravan old or new, or are a seasoned camper, a happy glamper, an intrepid first timer or are looking for special time away from it all in your very own holiday cottage we will welcome you with open arms at Fforest Fields. We are committed to making your holiday a relaxing one. The shower block on the campsite is new and we hope it provides the perfect base for all your needs, including washing up, family rooms, information and drying racks. We have a shop that runs on an honesty system and is stocked with simple essentials like milk and bread, fresh orange, yogurts, eggs and the famous Bujok Bacon! We also have home grown sausages and locally produced organic ice cream - which are both mouthwateringly good! The two lakes provide endless happy moments for paddlers, swimmers, honeypot makers and canoeing, which is particularly special as the sun sets or rises. Sit on your patch with a good book, or get on your bike, or help the children look for newts in the ponds or take a wander around the fishing lake, literally a stones throw from the site. From there why don’t you stretch out into the old wood or up onto the open expanse of hill above. We love it here and can’t wait to welcome for a special holiday ‘away from it all’. Fforest Fields is a secluded 12 acre rural caravan and camping site a few miles from the market town of Builth Wells in mid-Wales. 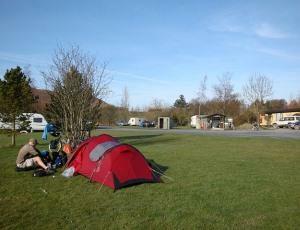 It is well drained & almost level with generous grass & hardstand pitches served by a circuit road. It is landscaped with natural banks full of flowers and wildlife. There are plenty of trees to provide shelter & screening. Find out more about the campsite. We also have a glamping option with one (soon to be two) lovely bell tents that allow you to get as close to nature as possible without bringing your own tent. On the farm, but away from the campsite, we have two great holiday cottages. Y Ffos is near the main farm house, which looks out over the Edw Valley and enjoys some of the very best sunrises we know. The other cottage is tucked up at Ffynnonau and looks just how a child would draw a country cottage. Thick stone walls and pretty little windows, the garden comes to life in spring and the babbling brook out the back door is perfect for dozing beside! We are a dog friendly site for well-behaved dogs and Fforest Fields is an ideal place for a dog walking holiday. Dogs just love it here, as there are masses of lovely farm and woodland walks straight off the site. We usually allow a maximum of two dogs, but give the office a call if you do want to bring more. One thing you will really notice at Fforest Fields is the peace and quiet. Situated up a track off a minor A road, the campsite is a haven for those seeking proper family time or a break from the 9 to 5. While there is always a gentle buzz around the campsite and the community feeling is fantastic, there is no traffic noise, no clubhouse, no specific children’s play area - we find they simply love exploring the campsite, the ponds and cycling. We take a relaxed approach because we want you to feel right at home, so we keep everything ticking along with as little interruption to your holiday as possible. We are proud of our campsite & the birds & wildlife it harbours. The idea was always to give everyone an opportunity to experience this wonderful part of the country. Since starting the campsite, 25 years ago, we have always been mindful of preserving the beauty, encouraging the wildlife and making sure that what we provided as little disruption as possible. We mow it carefully and leave the borders and banks as sanctuaries for small mammals and insects which feed the birds. We have received the David Bellamy Gold Award for our work in environmental conservation for the last fifteen years, which we are immensely proud of. So, you may occasionally get a hedgehog in your awning, or spot a fox making a dash across the site in the night, or see some swallows just after they’ve hatched squawking to be fed or hear a hooting owl in the twilight hours - we think all that’s pretty special. There is lots to do at Fforest Fields. Straight from the campsite or holiday homes you can walk out onto the farm, up tracks, through wooded areas and even out onto the vast expanse of hill. There are some fantastic sights to be seen short distances from the campsite and we know some brilliant, breathtaking drives that allow you to explore the local area from the comfort of your car. Beyond walking, driving and stopping to gawp, there are lots of activities such as fishing, golf, mountain biking, horse riding and paragliding near the campsite. For little ones, there are some great activities nearby such as a small breeds farm, caves to explore and water sports. But there are plenty of opportunities to get muddy on the farm and often find children are happiest with a bicycle and a sense of freedom! Fforest Fields is a 4 star caravan and camping site set on our family farm in the middle of an area of outstanding beauty in the Welsh countryside. We are honoured that you choose to spend your precious holiday time with us and we work hard to ensure that your stay here is as special as it can be. Most of the time that simply means a patch of grass, family, friends, views, hot showers and space to breathe. Whether you come with a caravan old or new, or are a seasoned camper, a happy glamper, an intrepid first timer or are looking for special time away from it all in your very own holiday cottage we will welcome you with open arms at Fforest Fields. From Builth Wells take A481 NE towards village of Hundred House. After four miles, wide entrance on right. Campsite 300m up farm road.